In January 2015 at age 3 1/2, Presley was given the diagnosis of "severe apraxia". 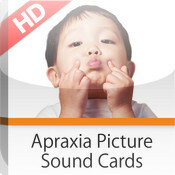 WedMd says this about it: "Developmental apraxia of speech is also known as childhood apraxia of speech. This condition is present from birth, and it affects a child's ability to form sounds and words." In other words, they may know what they want to say, but the words do not come out. 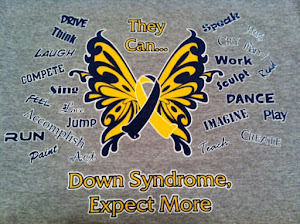 Up to 40% of children with Down syndrome are diagnosed with it. The therapist said she wasn't sure though, because the few words Presley did say came out consistently the same way and same tone. 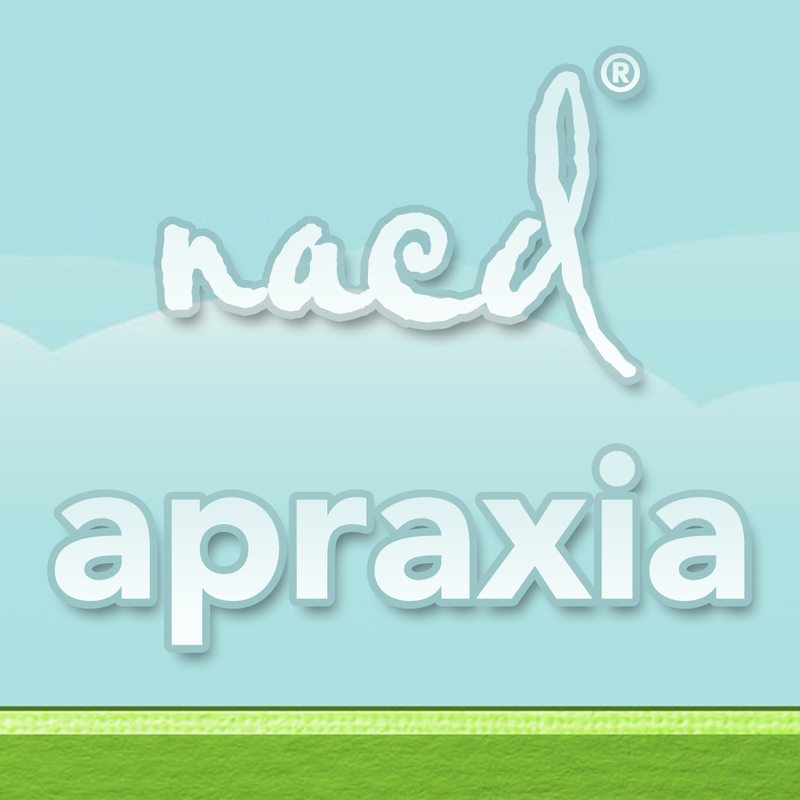 The therapist said apraxia of speech typically says the same word a little different each time. Presley could communicate her needs, but there had been very little actual speech from her. After her evaluation, her speech therapist quit, and we began trying a few different interventions. By June 2015 (less than six months later and just a month before her 4th birthday), Presley went from silent gestures to babbling, reading her word cards out loud, imitating us, and trying to make her big sister laugh. Here is a video of Presley and her sister Payton working on word cards when she first became interested in speaking: https://www.youtube.com/watch?v=dmImQzFf9Jc (2015) What made Presley begin talking? She did. When the time was right, she began talking. The articulation needs work, but it is coming along great and I am thrilled to have words to work with. Presley was recently evaluated and is reading on a 2nd grade level, so I knew cognitively she was well prepared, but getting her to form words was completely out of my control. So, we continued the course of laying a solid foundation for good speech. We still have a long way to go, but hearing her sweet voice is a true blessing. I hope this list of our interventions helps someone else. 1. Geminii - http://gemiini.org/ - we began this in January 2015 when our SLP bailed on us. It seems to really give Presley the confidence to sound words out. They use repetition and lots of close up videos of someone saying the words. You can customize it to words you are working on and even conversations. Great program with great results. 2. Neurodevelopmental program - we use NACD (http://www.nacd.org/) but there are others like ICAN (http://www.senc.us/3.html) so find a reputable evaluator close to you. NACD has guided me every step of the way. They believe it is all about INPUT, INPUT, INPUT! Keep expanding the receptive language and the expressive will follow. Most of the ideas on this list are from them. We have been with NACD since Presley was six months old. Video 1 - basic initial speech sounds and reading two simple books. 8 minutes long. Video 2 has basic speech sounds, alphabet letter sounds, flip charts, reading sight words, and more. It is over 30 minutes long. Video 3 includes following directions, many basic words shown with a close up of the mouth, reading, sequencing, different emotions, brushing your teeth, reading, five senses, chores, days of the week, months of the year art, and pat a cake play. It is 34 minutes long. 4. Oral Motor therapy techniques: we use NACD and talk tools equipment such as bite blocks, horns, straws, etc.. Have an evaluation to ensure everything is strong enough with proper placement for speech. Many moms have had their children checked for tongue and/or lip ties and had them clipped to encourage better speech. **Also check out Speech Buddies. I have heard some have used it with success. 7. Diet and supplements: We have tried many supplements and TNI. We also include lots of healthy fats to feed the brain such as avocados, almond or sunflower butter, etc... We are gluten free and dairy light with some cheeses. The gut is known as the second brain and has a direct influence on cognition and "brain fog". I can't say if any one supplement worked for us, but we continue to support her body by testing for deficiencies/issues and adjust accordingly. Here is an example of our breakfast and morning smoothie routine. Sometimes we made videos (I have visual learners obviously) with us just reading books. Soon Presley began mouthing words and reading along with the video. 9. Music - Presley loves music, so we used several different sources. Here is an article explaining how music stimulates language development in DS. these videos, so she is not playing a video in her head when she hears it. * Readeez - http://www.readeez.com/ videos with words and singing. Here is their phonics song. They have many more videos and DVD's and my girls have really enjoyed all of them. Presley also loves these bible songs with moves to memorize for kids. She sings along with them and loves matching their movements. Great messages for kids too. 11. Exercise: there are so many studies that link exercise with increased cognition. Here is one article: http://www.disabilityscoop.com/2013/03/07/can-exercise-down-syndrome/17448/ NACD also encourages encouraging learning while the intensity is high (while they are having fun). We would go for nature walks and draw alphabet letters in the dirt as we walked and name everything we saw. There is a saying well known within the DS community of "two miles of walking equals talking". Core strength is always good for speech. 12. Speech apps: NACD has a good collection for the ipad: http://nacd.org/speech_sound/apps.php We also used articulation station, Tiga talk, and Speech 4 Kids. 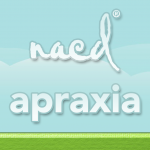 Here is a good list from apraxia-kids website. 13. Ears: Stay on top of hearing, watch out for fluid retention and ear infections with any congestion. You can request an tympanogram from your Pediatrician when your child has congestion and again after it has resolved to see if fluid remains. It tells you whether the tympanic membranes is able to move or not. Routine audiograms should be conducted to assess hearing. Children will obviously have difficulty repeating sounds if they can not hear them clearly. 16. Mango or papaya powder - Dixie Lawrence of Trisomy 21 Research suggests some children with apraxia have a FOXP2 mutation. She states "the development of FOX2 neurons is a process, first they must be born then migrate, then connect to other neurons, then survive" so changes may occur slowly. This has to do with low histamine levels typically seen in DS and that raising these levels contribute to global advancement in development along with speech. Insomnia seems to be a common side effect when titrating for effect. Learn more on her Facebook page Trisomy 21 Research. 17. Feuerstein approach - I am not as familiar with this, but I have seen it on several posts with positive reviews. Here is an article with more details. - Dr James MacDonald with Communicating Partners has a wonderful website here. He believes "Regardless of the number of professionals, children will learn to communicate best in their home lives. Parents have the greatest opportunity to teach their children how to communicate and yet there are very few resources available to parents for this purpose, This web site provides tested resources for building strong social relationships with children with delays". - We also use puppets, dolls, and toys for play interaction. I will hold one doll and say "Hi, my name is Doc, what is your name" and Presley will answer "Hi, I am Elsa". We then go to "How are you?" and she will answer "I am good". Sometimes I played this with my 7 year old first in front of Presley, and it would give Presley the cues as to what she should say. The other day Presley (now 6 years old) was walking through the grocery store and told a stranger "Hi, how are you" they answered back asking how she was and she responded "I am good, thanks" and then she kept walking. My 7 year old likes to use the dolls to act out scenes they just saw on tv, such as using Daniel Tiger or Strawberry Shortcake figures to act out a song they just sang or a part they thought was funny. - Ask about their day. Dad comes home and asks Presley what she did that day. Sometimes he has to give prompts such as "how did piano go today" or "did you get wet today" when she had played in the pool. If we went on a nature walk, he will ask "what color flowers did you see today", because he knows we talk about the wild flowers we see. Recently, we took pictures of all the wildflowers we see on our usual walking area. We then used an app called Plant Net to identify them. I put the pictures, along with the name of the flowers, into a small book using Microsoft word. Presley now says the names of the flowers as we pass them. - Say good morning. Every morning, as we leave the farm, I say "good morning cows", "good morning donkeys", "good morning creek" "good morning trees" and so on. Presley likes this and began saying it to things she saw too. So she was speaking, naming things, and paying attention to her surroundings. - Anticipatory speech. In one of the above speech videos, I would practice anticipatory speech. I would say something like "Mommy and Daddy, Mommy and Daddy, Mommy and Daddy, Mommy and .................". I would pause for a moment to allow her to process it and come up with the word "Daddy". If she didn't say it, then I would fill in the blank and celebrate. We also used anticipatory speech for the nursery rhyme songs she loves, such as "the wheels on the ........" and just wait for it. - State the obvious. We walk outside, I say "it is cold" "it is hot" "it is windy" "the sky is pretty blue today" "it is cloudy". We gives names, descriptions, and functions of everything we see. We also make lots of homemade videos describing things like this, so she gets lots of repetition. One video, I walked around the kitchen and named everything in the kitchen and what it does. Soon, she was grabbing items out of the drawer and naming them. When we go outside and the wind blows in her face, she will automatically say "it is windy". - Role modeling - we practiced a lot and recorded many of the interactions I wanted Presley to know. Sometimes I would practice with my 7 year old Payton first. There is also a great set of videos called Watch Me Learn that teach key developmental and social skills. - Visualization - several moms have recommended products for visuals and manipulatives like these from Lakeshore Learning. This can be used for creating carrier phrases using sentence strips, such as "I want.... I need....." and allow them to fill in the blank. Another tip from Jane Winans "Get a poster board and script out a good retelling of an event, but have blanks that she fills in with word cards at first but then from memory afterwards. Today I went to _____ (Disney) I saw _______. I rode on _______. I ate _____. My mom and I were _____ (having fun - smiling - being silly - hot ) I felt ___ today at _____. Do this every day until it becomes more ingrained." HOW CAN YOU HELP A CHILD HAVE CONVERSATIONS? 1. Talk about anything your child is doing or is interested in, no matter how insignificant it seems to you. Any kind of conversations are important at first. It is less important what you talk about than the fact that you both are talking back and forth for increasingly more and longer times. In daily life, we often have conversations mainly for the social connection with someone and not primarily for information or accomplishing a task. We need to allow casual conversation time for our children especially since the major task is to make them want to return for more conversations. 2. Allow actions to be part of the conversations. Conversations do not have to be continuous talking. Let actions do the talking at times. When you are playing with your child, join into the things he is doing and make words a part of the play. Occasionally, play and interact in the activity back and forth without talking. For many children, conversations are best learned as a way to supplement or help their play rather than being the major way in interacting. 3. Think of conversations as creative social play more than as conveying information. The less work we make for a child, the more he will stay in conversation. Talk with your child about anything at all allowing him to say whatever he wants. The conversation may seem unimportant or even silly to you, but the purpose is to show your child that he can have successful conversations with you without any pressure to say anything in particular. Let him know that talking back and forth is the goal, not talking in any particular way or for any purpose other than companionship. 4. Balance your conversations by taking turns. Conversations often stop when one person dominates them. Be sure that your child knows he will have time to take his turn and be equally clear with him that he needs to allow you to take your turn. For children learning to communicate, words are their most important social toys. Just as an aspiring ball player would practice throwing and catching balls many, many times; so too, children must practice exchanging words back and forth many times a day before they learn to enjoy and stay in conversations. Try to do only as much as your child in a conversation so that he does not learn to be passive, but has sufficient practice talking. On the other hand, be sure that the child allows you to talk as much as he does. Neither person should dominate the interaction. Your child needs to practice talking and he also needs to listen and respond to your talking. Unless he does both talking and listening, he will not be accepted in society as a desirable conversation partner. 5. Keep your child on a topic. Many children get easily distracted in conversations and need to learn to stay just a little longer on a topic. This is also a very effective way to teach a child more language. Too often conversations with children are brief and fleeting. This is understandable at first, but then it is important to keep the child talking about a topic for increasingly longer turns. 6. Respond to interruptions gently but firmly. Many children learning to communicate have difficulty not saying what is on their mind even if someone else is talking. Interrupting is normal when a child is young but can be a serious problem later on. Often a simple signal like raising your hand or looking away is effective in letting the child know he will not be successful in interrupting. Occasionally you will have to simply ignore his interruption and continue talking on your turn, then signal to him when you are done. Be careful not to talk too long a time. 7. Be sure that both you and your child have the freedom to express your own ideas. Children rarely pursue conversations with partners who do not respond to their ideas. Judgments and criticism discourage children from having conversations. Convince your child that he will not fail in conversations. 8. Make conversations out of your child's instrumental contacts for help and information. Rather than just satisfying a need or answering a request, keep the child for a few turns talking about what he is immediately interested in. 9. Turn your teaching times into brief conversations. Take homework breaks with easy conversations about what he is studying. Help him talk about what he is learning. 10. Turn your normal daily activities into conversation times, for example: meal times, watching TV and videos, doing chores around the house or yard, riding in the car (turn off the radio), all care giving activities you do with the child. Make quiet affection times into easy conversations. Talk about the child's immediate activities. The ultimate test of conversations is if the child stays and returns for more. Your child’s first words will not be whole words like yours. They will be pieces of words in sounds. Think of these as "WORDLETS." Every word is made up of many sounds. A word begins with only some of those sounds. These are called “Wordlets”. It is important to not consider wordlets as mistakes. They are not mistakes, but are developmental steps. They are not wrong, as they are the right way to build words. Think of wordlets as your child’s own language. It sounds like a foreign language and it is in many ways. Think of it as “Eric’s” or ”Rosa” language. And then translate that language into a word in your language. If he hugs his dog and says “goggie”, don’t tell him he is wrong. Just translate it with “doggie." It is like responding to a Spanish-speaking child saying “perro” with “doggie." Accept your child’s sounds as words then translate them. 20. So Happy to Learn - several moms have recommended this program by Mrs Brown. She has a monthly curriculum she sends to work with your child on math, reading, and writing. She is genuinely interested in helping us teach our children and make them successful. She has worked many years with children with DS. 21. Time: you can do everything on this list, but ultimately they will decide when the time is right. This is difficult when you know all the pieces are in their proper place, but nothing comes out. Stay strong and consistent, the end justifies the means. Continue laying the foundation with the right input, good sleep, good nutrition, good exercise, good hearing, good health, and time. 22. 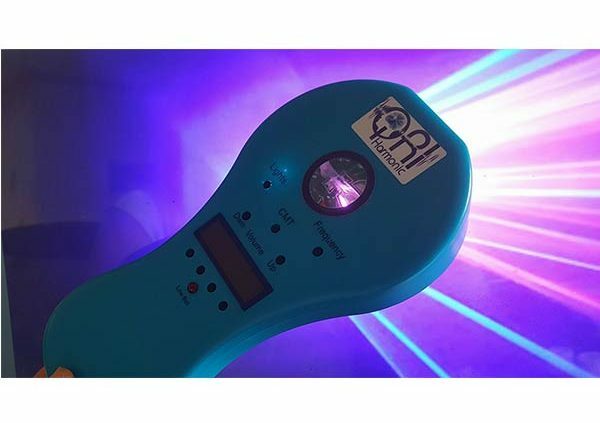 QRI Laser/Reflex integration: UPDATED August 2018, we had a very positive output of speech from using the QRI laser. We began integrating the reflexes using the laser then added the TALK, the helmet, ASD, and recently the cranial nerves protocol. Read more about the laser here: We had all the pieces in order and ready, but the laser and integrating reflexes helped give Presley the boost she needed to start actually talking. 23. Video Modeling - We have also enjoyed watching Watch Me Learn and Teach2Talk videos. They both give great examples of role modeling and conversations among kids, adults, and puppets. Easy and fun and gives mom a break to print off worksheets, research, set up next activity, or whatever. 24. Warrior Mom April Walker shared this technique she uses for her son called "scripting". She wrote " have a notebook and throughout the day I will write a question, and if he answers it in a 2 word phrase I will script it/write a complete sentence with his answer and he will repeat it. I ask questions about the weather, basketball, what he wants to eat, baseball, a show or movie he's watched. I can really see things clicking. He's able to use pronouns correctly and doesn't leave them out of the sentence." She also made these for creating sentences. 25. Nemecheck Protocol: There are several facebook groups with testimonials about the Nemecheck protocol and how it "woke up" their child with autism. There is also a book you can buy on Amazon which explains it in depth. There are also many videos on his youtube channel. Here is one mom's research and results which was quite interesting. Update August 2018: Presley continues to improve in her speech, articulation, and communication. She will ask "How did you sleep?" to everyone each morning and "How is your food?" to everyone at the table. She asks a lot of "where are we going?" and may ask it repeatedly. Her ND suggested when she repeats a question, she is trying to carry on a conversation, but doesn't know what to say next. So we keep it going by saying something like "We are going to the grocery store. What food do you want to pick out?". Presley has been going up to others and saying "Hi, what's your name?" and after she gets a response, she says "My name is Presley, this is my sister Payton, she is 8". After that, she needs help keeping it going. She is around a lot of people that love her at church, music, swim, and cheer that immediately begin to ask her questions to help her out when she pauses. She now loves to try to carry on a conversation with others and tell them about everything from her favorite color, to her cheer buddy, to what we did already that day. At home, she is talking most of the time, see for yourself in this video I just took of the girls using the dolls. (You can see her funny personality when she says "diaper salad" and then big sister runs off because the teapot was going off). Here she is singing and making up new songs when she thought no one was watching. Remember moms and dads, do not compare your child to others. Comparing will steal your joy of their accomplishments thus far. If I want to compare, I look back to 2 1 /2 years ago when she had only a couple of single words and then I smile knowing we are continuing to move forward. Stay the strong course, remember, this is a marathon, not a sprint. Disclaimer: Please discuss with your physician and/or therapist as to what may be the best for your family member. These are only some of the ideas that have helped us, but each child is different. My goal is to compile resources together to help others.